Beef Short Ribs, smoked slow until rich and incredibly tender. This is the ultimate comfort food. Today we have a recipe I’m super excited about! 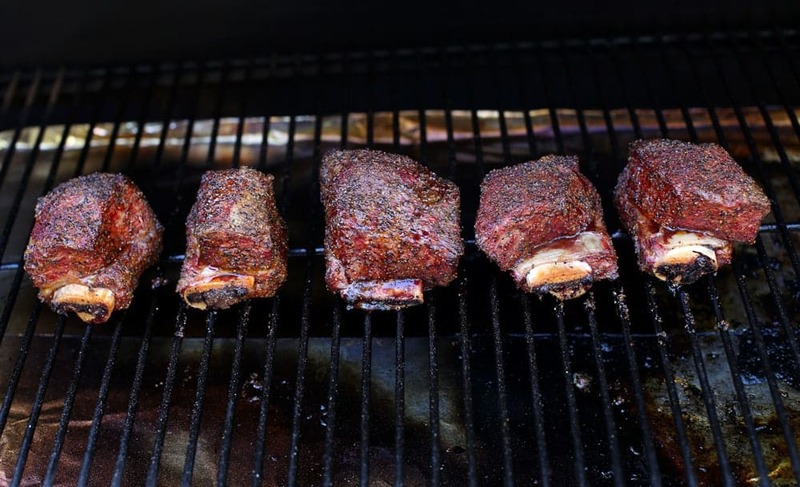 Smoked beef short ribs, slowly smoked until tender and rich and incredibly delicious. This is what I request every year for Mother’s Day because it’s my favorite meal in the world. Once upon a time I told you about that ten-year period of my life when I was a pseudo-vegetarian. It wasn’t until we bought our first smoker that I came around to the meat side. Shortly after that I had my meat epiphany at a restaurant in Honolulu called Chef Mavro (I LOOOOOVE this place!). It was a single cut of meat that did it for me — braised beef short ribs. The meat was so tender it melted in my mouth like butter. I promised if we could learn to cook meat like that I’d convert back to the dark side! I’ve been a convert ever since, and this cut of meat is why. The beef short ribs we are cooking here are typically smaller cuts (around 3 inches of bone) and meaty; and that’s likely how you will see them in the butcher case. Buying Prime, Choice, or even Wagyu cuts for marbling is key so that you get that flavor that makes them magical. I like to trim excess fat off of the top of the meat. You’ll see a thin membrane that, when removed, will expose that gorgeous meat that will pull that smoke in. Unlike pork ribs, you don’t need to take the membrane off the bone side. Leave it there so it can hold that beef on the ribs. Coat the ribs in olive oil and salt and pepper, or feel free to use your favorite beef rub. I wrap when I see the color I am looking for (a rich, red, mahogany sheen), then letting the meat baste in its own juices and getting that collagen to cook out. This will usually happen at around the 3 hour mark. You can also add the meat into a beef broth/wine bath for moisture and flavor as well. I like a combination of broth and wine for flavor. It’s really about what flavor you want. But in the end, what you want to do is get the beef time on smoke for a few hours, and then finish the cook by getting the internal temperature of the beef ribs to over 200 degrees (between 200-205 is the sweet spot). 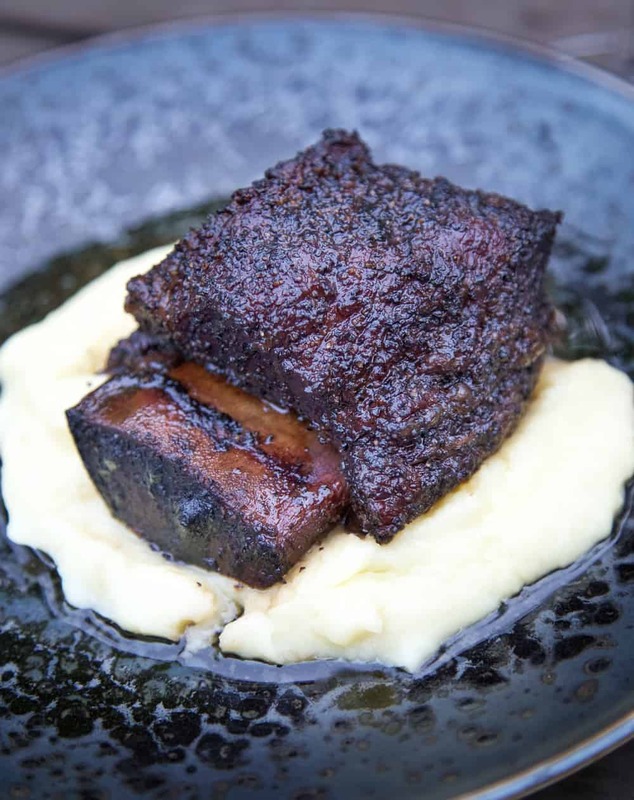 This is when that fat and collagen all melt away, and the texture of the short ribs is soft like butter and melts in your mouth. It’ll be super tender, but not spongy. 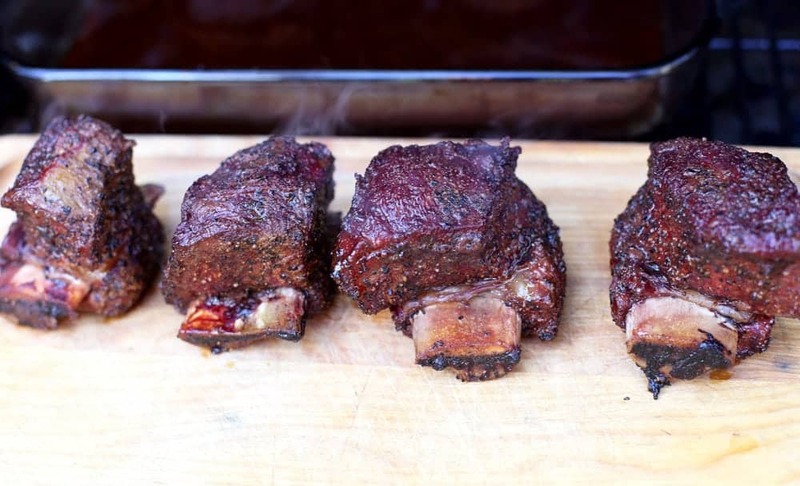 Recipe for smoked beef short ribs and tips and tricks for getting that melt-in-your-mouth tender meat. Trim excess fat and membrane off of the ribs, coat in olive oil and your rub. Be sure to get all sides of the beef. Place beef on the smoker for about 3 hours, until the color is mahogany and a nice crust has set. After the first hour during the smoke period, start spraying the meat every 30 minutes with your spritz until you wrap. At about the 3 hour mark, Wrap (optional) – you can either wrap in foil or place in a baking dish along with your bath ingredients and then cover with foil for about two hours (like pictured above). If you don’t wrap, make sure to keep smoking and spritzing. You are looking for an internal temperature of 200 degrees. Serve when the beef is tender and almost falling off the bone. If they appear rubbery or spongy, they are not quite cooked yet, so keep going until it reaches 200 – 205 degrees. Cooking time will vary based on size of your short ribs. Plan on 5-7 hours of cook time. You’ve got an incredibly tender texture from the meat, and a lovely smoky infusion. Much of the fat has rendered out, but what you are left with is juicy, melt-in-your-mouth meat. We also let the meat braise in a shallow bath of wine for awhile, picking up some of those concentrated fruity flavors, but not as long as a traditional oven roasted wine braise. For this I’m looking for a red wine that a somewhat rich and velvety texture, with medium to low tannins and deep fruity flavors (not ripe or overly sweet). I want something full-bodied, but not overly intense, and I want some acid to refresh the palate. 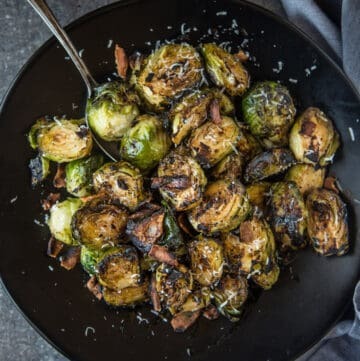 We’ve made this several times, with several preparations (including transferring the meat to a richer braise with vegetables and wine, and serving over polenta with blue cheese), and also what we have here, which is simply prepared over some grilled greens. Both were spot on with Cabernet Sauvignon. But I would avoid an overly tannic wine, like, say, a young Napa Cabernet. Turn to other regions like Sonoma, Chile, or those from Washington State. Other Options: Sangiovese can also work nicely with its stewy, herbal, and smoky notes. Rhone reds will also offer some lovely savory notes to match the meat. I’m also curious to try it with a moderately rich Syrah. 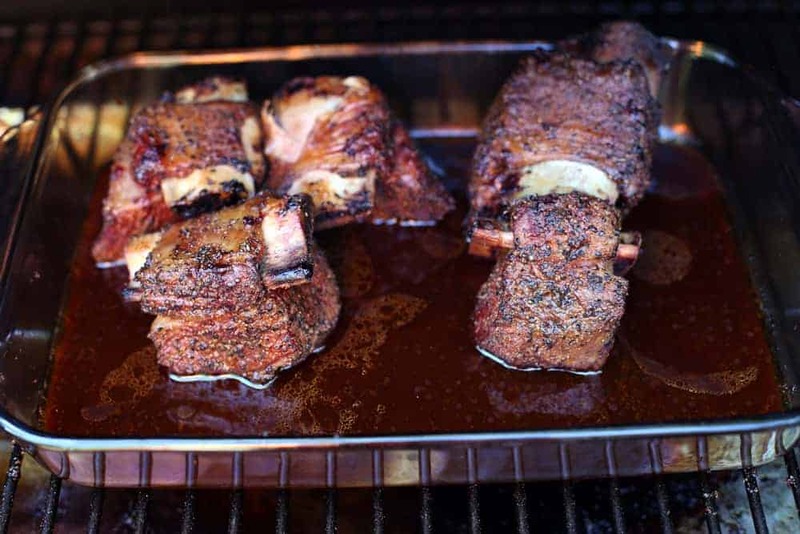 Check out our Video for our Wine Braised Smoked Beef Short Ribs here! First off – Your Mother’s Day benedict looks FANTASTIC! Second, these RIBS!!! They look absolutely amazing. 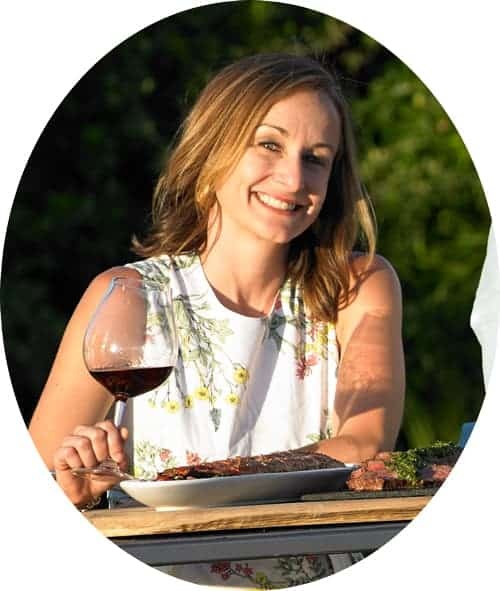 I’m constantly inspired by you to get out there and grill – And drink wine… Which I don’t need to much inspiration for… But I’m always a fan of your amazing knowledge on pairings! Can I celebrate the next holiday with you guys?!! You don’t mess around! Ha! Of course 🙂 You know, the next big one is Memorial Day Weekend… coming up so soon!!! Oh Im going to have to show this to my husband for us to make! 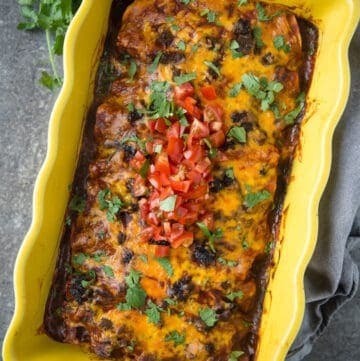 My mouth is watering just looking at your pics and I definitely should not have looked at it when it is almost dinner time and I am starving! Now how can my dinner live up to these delicious looking ribs. 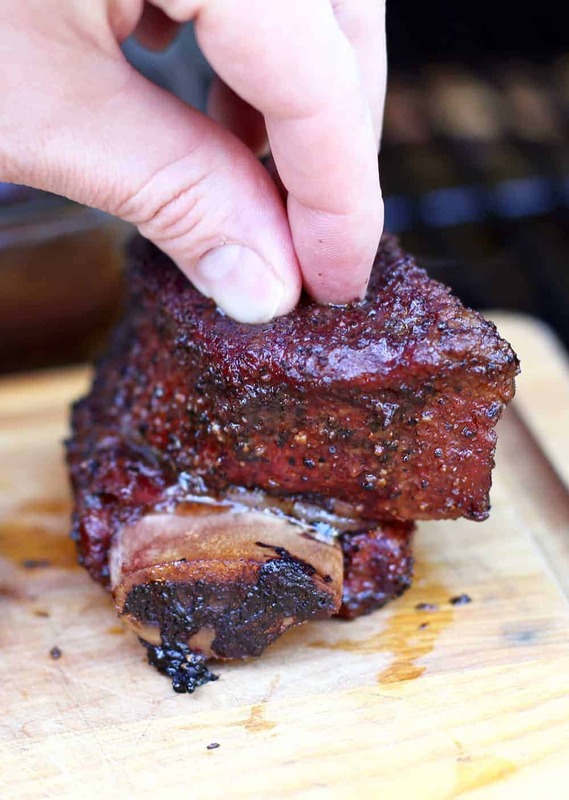 I have cooked short ribs in my Dutch Oven and they come out so yummy but grilling is our favorite way to cook so I know we will try this out in the near future. I looooooooooove short ribs in the dutch oven. That’s how we traditionally did it before the smoker. So tender and buttery texture. Yum! These look AMAZING! I can’t wait to try this. I was JUST telling my husband that ribs sound SO good! May have to give these a try, they look amazing! And I love the wine pairing. Oh wow this looks amazing. The breakfast the ribs! All of it. I haven’t had ribs in a while. Now the Texan in me NEEDS BBQ! Those ribs look amazing! I wish I could have a plate of those right now! Be still my meat-loving heart! I love ribs and barbecue, but have never attempted barbecue ribs before because I was always afraid I’d screw it up and they’d be way too dry and overdone. Can’t wait to try these! Yum! Ha! Thanks so much 😉 And you won’t screw it up! 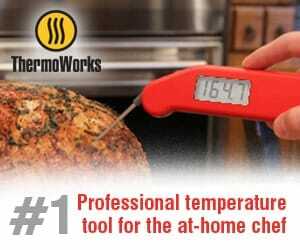 Just go low and slow, and always use a good thermometer. Oh yum! 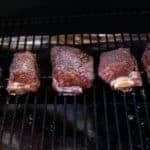 We love short ribs but hardly ever make them at home since it seems difficult to achieve, but I’ll have to send this recipe to my husband for our summertime bbqs! They’re not very difficult at all. The key is just taking your time! Lots of time!! Don’t any of the replying posters ever actually make the rib recipe? I am interested in actual critiques, not a bunch of how good it looks or sounds. I made these and they were perfection! 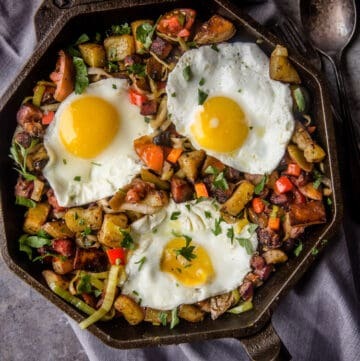 I followed this recipe after reading many others as this one made total sense. We are doing them again today but with a twist; going to souse vide them for 10 hours first, cut the smoking time down a bit and use the broth wine bath. Can’t wait. Wondering how you feel about doing the three hours of smoking then transferring to the oven in the bath. I’ve read once you wrap, they won’t absorb the smoke any longer, and if I keep my oven low, I’d say 300, I might cut down on some cooking time, with all the marbling we should be pretty good. What are your thoughts? Kerry you can totally use your oven. We don’t because the cooker is already running at temp, so we just elect to continue to use the smoker. But if you pre-heat and then just put into the oven, you should be good to go. Just be sure you watch your temp and time like if it was still on the smoker. Thanks, we’re making them a second time today. We ended up transferring to our Weber gas grill at 300 in the bath, wrapped after the smoke. It turned out perfect. I also made a slurry and created a traditional gravy out of the bath. Four thumbs (and two paws) up from the berenato’s! That’s so awesome to hear!!! That gravy sounds delicious! 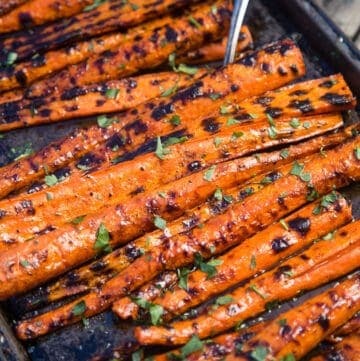 This recipe looks amazing and I plan on firing up the smoker tomorrow to give it a whirl. As I am fairly new to smoking, one discrepancy I have found across different recipes is the final internal temperature to call the meat done. The 200-205 is something I have found to be a good temperature for meats such as this one but what I have not been able to conclude is now long it should be at this temperature. Should the meat be removed immediately once the desired temperature is met or should it be allowed to sit at that temperature on the heat for a while to further allow the melting of fat and collagen? I hope this make sense. Thanks in advance for the help. Ryan, all great questions. In this specific recipe and for beef brisket/beef ribs/pork shoulder, we use the temp as a guide and are really looking for texture. So the simple answer is that once you insert the meat probe and it easily goes into meat like putting a knife in warm butter, then you are done. The fat is rendered out and you do not need to keep the meat going for any longer. As the meat is approaching that point, that is when the fat is rendering out. If you keep going, you will then be running the risk of drying out the meat. Next, you should let your meat rest, as the warmed up cells and all that fat that rendered want to reabsorb that flavor and moisture and letting it rest will allow the cells to cool, thus contracting, and pulling the juices back in. For big cuts, we will use a cooler (no ice) to do this and wrap the meat in a towel. Excellent! Tried this tonight and really enjoyed it. Paired with a Cabernet Sauvignon from Damiani in the Finger Lakes of New York and went well. 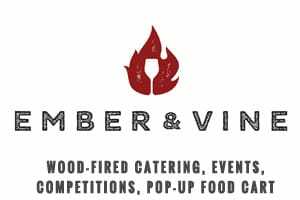 Awesome, Sean (pitmaster) is from Rochester and we’ve loved touring the area for fun varietals! Thanks for sharing. Really good ribs! The spritz built up a delicious acidic crust that through the fatty richness of the beef. So great to hear and thanks for the feedback!!! I’ve previously smoked OR braised beef short ribs but never the combo until yesterday and it was Da Bomb as the kids say. I put my braising red wine and beef stock underneath the short ribs (they were on a rack above) and the smokey droppings added to the flavor, as did some shallots, garlic, carrots and sprigs of rosemary and thyme. The braising broth was strained, and simmered down to reduce it a bit, and I added a generous slice of butter at end and it made a very flavorful thin broth to drizzle over the meat resting on mashed potatoes. It was tremendous and have leftovers for today. OMG these are amazing!!! Thanks so much for sharing, Mary! Where is the recipe for the gorgonzola polenta??? Sharon, we used a recipe inspired by Bon Appetite, there are a number of them out there that you can select. Other options could also include a paring or other root vegetable puree. With lots of butter of course !!! 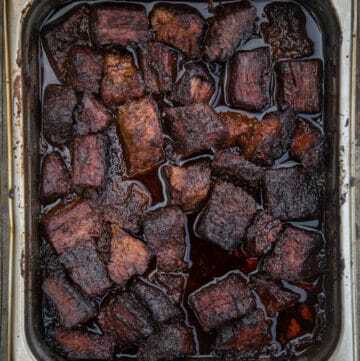 I have made this many times I cook them on a pellet grill I have paired them with a 2005 Barolo low and slow is the key I have used the 3-2 1 cooking method comes great every time. I used an espresso coffee rub and spritzed with Dr Pepper. Try it, you will not be disappointed. Thanks for the GREAT recipe Mary. Definitely a 5 star review from us. My previous attempts with short ribs were 3 star at best (but had to be hungry for that rating). I love recipes with wine as an ingredient. Keep up the awesome work, love your site. I did this recently and paired it with a 2004 Penfold’s Grange Shiraz, a 2004 Araujo “Eisele Vineyard” Cabernet and a 2009 Pax “James berry Vineyard” Syrah. A fantastic meal! That sounds amazing!!! We love the Penfold’s around here! Thank you for sharing!! Awesome!!! Take photos and share/tag us on Facebook or Instagram! Oh we totally approve of that message, we should add that to the instructions!!!!! Thanks for the feedback and following along on our bbq journey!